One of the most reliable reconnaissance systems of the Bundeswehr is the target acquisition drone, also known as KZO for short. 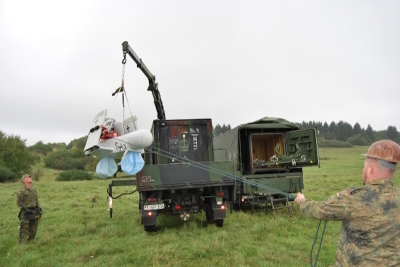 To make this drone fit for the future, the ground control station (GCS) has been subjected to comprehensive updates that have now been tried and tested in the context of flight trials at the Baumholder major training area. Accompanied by a loud bang, the high-technology piece of equipment soars into the skies. After no more than a few seconds, the target acquisition drone has disappeared in the low September clouds over the Baumholder major training area. Visibility conditions for the camera installed in the reconnaissance drone are poor. The KZO drone is used, among others, by Army artillery. It can be employed for target reconnaissance purposes both during the day and at night with a mission radius of more than 100 kilometers. To this end, the drone is equipped with an infrared sensor. The drone and the sensor are both controlled from the ground control station. “Especially in the GCS, we had to replace hardware and software. Technology has evolved rapidly since the first system was delivered in 2005”, says Lieutenant Colonel Frank Jobelius. The measures aim at making the KZO drone fit for the upcoming tasks within the framework of NATO. “Germany is planning, for example, to employ this drone in the Very High Readiness Joint Task Force, also known as NATO Spearhead”, Jobelius continues to explain. To achieve this, everything must work properly in the flight trials. In their preparation, substantial tests had to be performed even on the ground. Support has come, and continues to come, from the Bundeswehr Technical Center WTD 61 in Manching, which is responsible for flight trials, the Federal Office of the Bundeswehr for Military Aviation, the manufacturer Airbus Defence & Space GmbH, and the soldiers from the second battery of artillery demonstration battalion 345. After all items of the test program have been checked successfully, the drone approaches the intended landing site. The drone can be heard a last time passing high above the heads of the soldiers before the engine falls silent. As the drone finally sails through the clouds, the landing parachute has already opened up. The impact on the ground is softened by two airbags. Shortly after that, the drone is lifted, with its wings folded upward, by the recovery vehicle and stored in a container. Both reverification and preparation for the next flight take place in the context of remote maintenance.